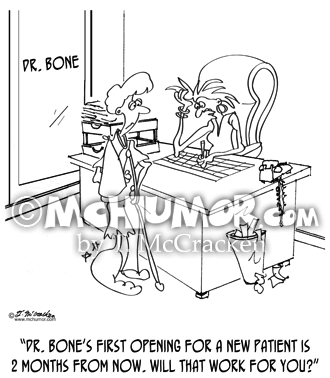 Doctor Cartoon 8338: Looking at doctor with a completely blank face (i.e., no eyes, no nose and no mouth) a patient asks another, "Have you noticed how hard this doctor's face is to read?" 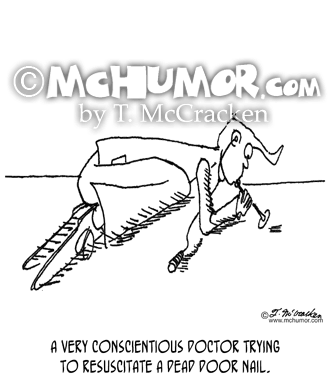 Doctor Cartoon 1132: "A very conscientious doctor trying to resuscitate a dead door nail." 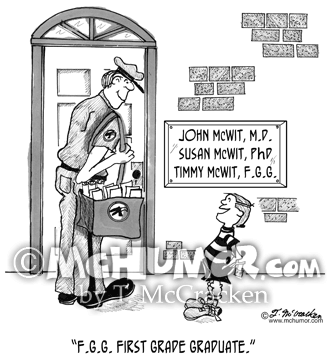 Education Cartoon 1786: A kid in front of a house with a sign, "John McWit, M.D., Susan McWit PhD, Timmy McWit, F.G.G. 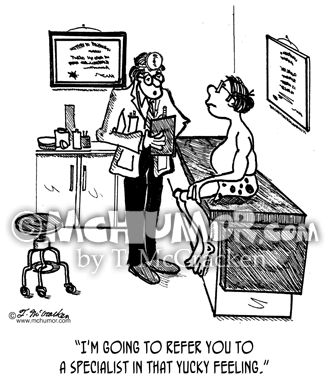 explains, "F.G.G. 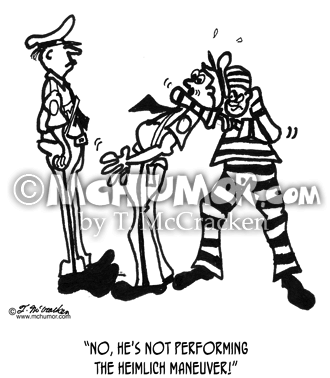 First Grade Graduate." 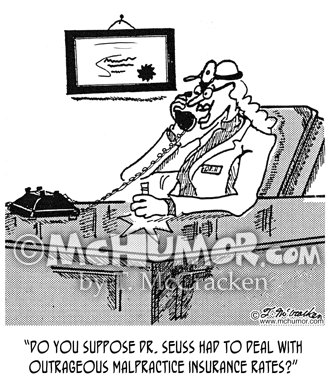 Doctor Cartoon 2179: A doctor on the phone asks, "Do you suppose Dr. Seuss had to deal with outrageous malpractice insurance rates?" 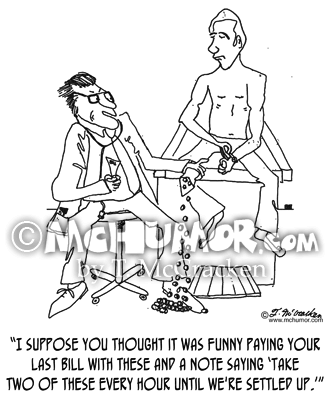 Doctor Cartoon 0274: A doctor pouring out a bunch of pills from an envelope says to a patient, "I suppose you thought it was funny paying your last bill with these and a note saying 'Take two of these every hour until we're settled up.'" 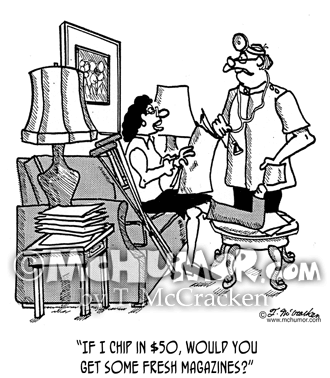 Magazine Cartoon 2182: A woman in a doctor's waiting room asks, "If I chip in $50, would you get some fresh magazines?" 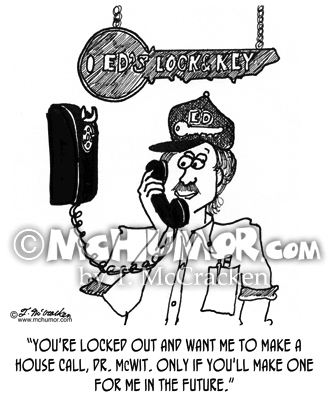 Locksmith Cartoon 1953: A locksmith on the phone says, "You're locked out and want me to make a house call, Dr. McWit. 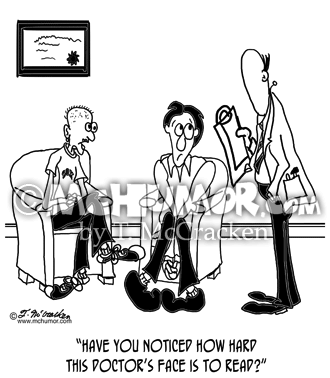 Only if you'll make one for me in the future."